With this volume 31 ORIGINAL PIECES Vol. 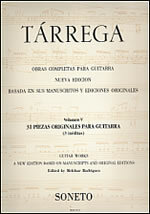 V, Tárrega's original plays are completed. It contains: Famous dances, Fantasíes, Varíations.